The Quest for Height: Grow Taller | Increase Height | Bone Size: Can Osteochondroma increase bone length in adults and be Proof of the LSJL concept? Can Osteochondroma increase bone length in adults and be Proof of the LSJL concept? Osteochondroma: benign endochondral neoplasms or developmental lesions that have a cartilage cap and arise from the underlying bone.<-This is what we're trying to do with LSJL. Inducing new cartilagenous growth plates within the endochondral bone. Static winging of the scapula caused by osteochondroma in adults: a case series. "We describe three cases of static scapular winging with pain on movement. Case 1 is a Caucasian woman aged 35 years with a wing-like prominence of the medial margin of her right scapula due to an osteochondroma originating from the ventral omoplate. Histopathological evaluation after surgical resection confirmed the diagnosis. The postoperative course was unremarkable without signs of recurrence on examination at 2 years. Case 2 is a Caucasian woman aged 39 years with painful scapula alata and neuralgic pain projected along the left ribcage caused by an osteochondroma of the left scapula with contact to the 2nd and 3rd rib. Following surgical resection, the neuropathic pain continued, demanding neurolysis of the 3rd and 4th intercostal nerve after 8 months. The patient was free of symptoms 2 years after neurolysis. Case 3 is a Caucasian woman aged 48 years with scapular winging due to a large exostosis[formation of new bone on the surface of the bone] of the left ventral scapular surface with a broad cartilaginous cap and a large pseudobursa. Following exclusion of malignancy by an incisional biopsy, exostosis and pseudobursa were resected. The patient had an unremarkable postoperative course without signs of recurrence 1 year postoperatively. Based on these cases, we developed an algorithm for the diagnostic evaluation and therapeutic management of scapula alata due to osteochondroma." "Magnetic resonance imaging (MRI) showed a hypointense cartilaginous cap of a maximal thickness of 1cm with an accompanying pseudobursa without signs of malignancy." "The MRI depicted a cartilaginous cap of 0.8cm thickness and a large (5 × 4 × 10cm) accompanying soft-tissue tumor surrounding the bony mass"
"large tumors, in particular those that are malignant, may further enlarge and deform the entire scapula rather than winging"
Enchondroma protuberans of ulnar bone: a case report and review of literature. 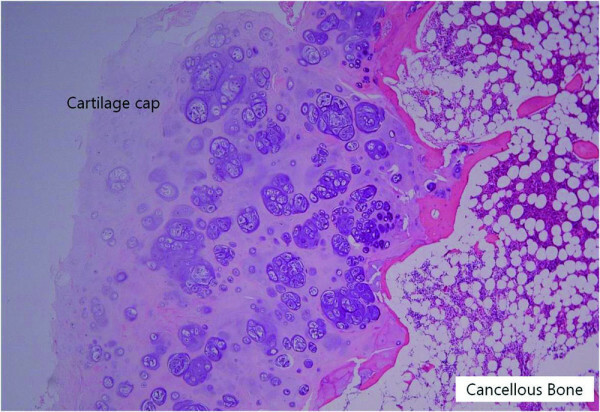 "Enchondroma protuberans is an extremely rare benign cartilaginous bone tumor. We report a case of enchondroma protuberans originating in the left ulnar bone of a young woman. A 20-year-old female referred to our hospital complaining of progressive sustained left forearm pain with a radiation to fourth and fifth finger. Conventional radiography revealed a well-defined eccentric osteolytic lesion in the distal diaphysis of ulna with expansion of overlying cortex (without calcification). Magnetic resonance imaging showed a well-defined ovoid intramedullary lesion, which was exophytically protruding from medial surface of left ulnar bone. Histopathology confirmed the diagnosis. Enchondroma protuberans typically present as a well-defined intramedullary osteolytic lesion that may be accompanied by a fine matricidal calcification. The connection between the intramedullary portion and the exophytic protrusion can be seen well by magnetic resonance imaging." Solitary osteochondroma of the twelfth rib with intraspinal extension and cord compression in a middle-aged patient. "This study reports the case of a 58-year-old patient with a solitary osteochondroma of the 12th rib with intraspinal extension and spinal cord compression." 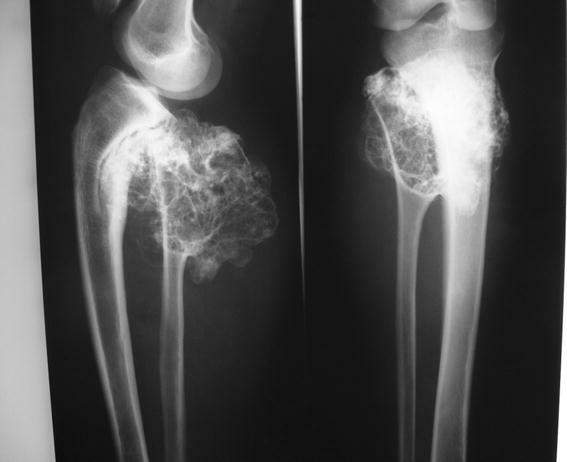 Giant osteochondroma of proximal fibula in a skeletally mature patient. "The growth of osteochondroma usually ceases when skeletal maturity is reached but becomes a matter of concern to the attending doctor if the lesion becomes painful and shows evidence of increased growth even after physeal closure, which may be an indication of sarcomatous change in the lesion. We present a case with substantial growth of an osteochondroma after attainment of skeletal maturity. The tumor turned out to be histologically benign, and patient had an uneventful recovery with no recurrence." "A case of 22-year-old woman, Asian Indian in origin, presented to us with pain and swelling right leg on its proximal and lateral aspect. Her history spanned a time period of 4 months during which she complained of an increase in size of swelling and severity of pain." A calcaneal osteochondroma with recurrence in a skeletally mature patient: a case report. "We report the clinical and radiologic findings of a calcaneal osteochondroma with an extremely rare placement and painfull, rapid reccurence following surgical excision in a skeletally mature female. The lesion showed growth the first-operation later and was re-operated. Histopathological examination did not show malignancy. It should kept in mind that benign osteochondromas can show symptomatic growth in skeletally mature patients without malignant transformation." "The anterior-posterior (AP) plain x-ray radiography and computed tomography (CT) revealed a bony prominence 27 × 23 mm (cartilage cap thickness: 7 mm) in size raising from posteromedial of the calcaneus and reported to be an osteochondroma"
" In the operation, it was observed that the lesion raised from the most inferior and posteromedial side of the calcaneus and grew through the surface pushing the soft tissues more posteromedially."